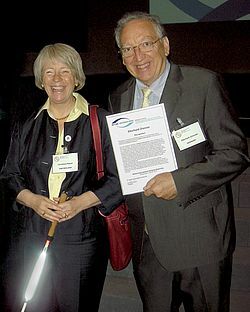 Retina Implant, AG, a leading developer of electronic implants to treat blindness, today announced that its founding director, Professor Eberhard Zrenner has been formally recognised by the 16th General Assembly of Retina International for his outstanding contribution to the work of the global retinal degenerative disease movement. Professor Zrenner, who is also Director of the Institute for Ophthalmic Research and Head of Department at Tübingen University, received the certificate from Christina Fasser, President of the Retina International General Assembly at their 16th annual meeting in Stresa, Italy last week. Ms Fasser says, “Professor Zrenner’s outstanding commitment and enthusiasm has been largely instrumental in degenerative disease, resulting in the current coordinated energetic and focused worldwide research effort to find treatments for retinal degenerative diseases (RD). The Professor is serving as our Chair of the Retina International Scientific and Medical Advisory Board and is spearheading the establishment of international and European research networks in RD. His pioneering work will bring hope to a great number of people with these conditions. Professor Zrenner is at the heart of Retina Implant, a company that is restoring unprecedented levels of vision to blind patients suffering with retinitis pigmentosa (RP) through the implantation of a sub-retinal chip. Its first clinical trial began in Germany in 2005 and involved 11 patients, the results of which far exceeded the company’s initial expectations. Some patients were able to see objects and shapes clearly enough to read large letters and recognise words. Following the success of this initial trial, Retina Implant is currently recruiting patients for its next clinical trial which will take place in the UK later this year and will be led by Professor Robert MacLaren, Professor of Ophthalmology at the University of Oxford and a consultant retinal surgeon at the Oxford Eye Hospital and includes Mr Tim Jackson, a consultant retinal surgeon at King’s College Hospital in London. Professor Zrenner attended the Retina International Meeting in Stresa in June 2010 with some of his colleagues from Retina Implant to lead patient workshops about the new implant and encourage applications for the next forthcoming trial. The workshops proved to be extremely popular, with every seat being taken.